Kirtland, Matthew H - Fulbright & Jaworski (Lawyers) is practicing law in Washington, District of Columbia. This lawyer is listed on Lawyer Map under the main category All Law Firms in Lawyers. The international law firm of Fulbright & Jaworski is a full-service, international law firm serving the needs of businesses, governments, non-profit organizations and individual clients world wide. 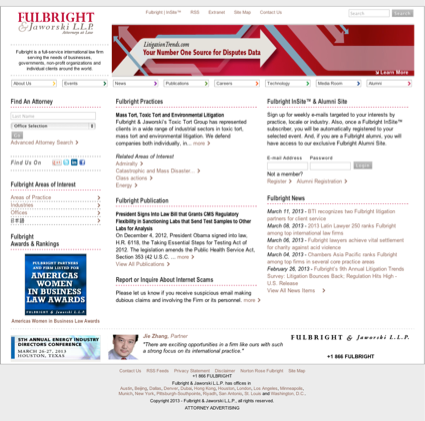 Fulbright is one of the largest international law firms in the United States with nearly 950 lawyers and more than 50 integrated practice areas and over 50 types of litigation practices. Fulbright has 16 locations through out the world, including international locations in Beijing, Dubai, Hong Kong, London, Munich and Riyadh and domestic offices in Austin, Dallas, Denver, Houston, Los Angeles, Minneapolis, New York, St. Louis, San Antonio and Washington, D.C.
Kirtland, Matthew H - Fulbright & Jaworski is listed under Lawyers in Washington, District of Columbia . There's currently no information available about fees or if Kirtland, Matthew H - Fulbright & Jaworski offers free initial consultation. The information below about Kirtland, Matthew H - Fulbright & Jaworski is optional and only visible if provided by the owner. Call (202) 662-4659 to learn more. Contact Kirtland, Matthew H - Fulbright & Jaworski to find out about hours of operation / office hours / business hours. Listed business hours are general only. Call (202) 662-4659 to learn about office hours.